Really Rolling Hills, or World 2-4, is the tenth regular level of Super Mario 3D World and the fourth one in World 2. It is unlocked via completing Puffprod Peaks or Shadow-Play Alley, and its own completion unlocks Big Galoomba Blockade. The main gimmick of this level is the hills that constantly turn in circles. The level starts in a grassy plain inhabited by Galoombas and Skipsqueaks, with a nearby ? Block giving the player a power-up. After passing some more enemies, rolling hills, and a Red Ring, the player reaches the Checkpoint Flag. A nearby pipe leads the player to an underground area infested with Galoombas, Spiny Skipsqueaks, and cog-like platforms. After navigating through the area, the player comes upon a pipe which leads them to the Goal Pole. Green Star 1: Near the very beginning, the player must use the Cat form to climb a cliff between two clear pipes. Green Star 2: During the underground portion of the level, there is a green Warp Pipe that's partially blocked by purple Brick Blocks. The pipe leads to an odd room with Color Panels that, when all activated, will reveal the second Green Star. Green Star 3: After the second star, the player must fall between the rotating wheels to find the third Green Star. 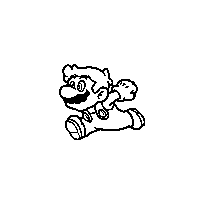 Near the beginning, there is a Character Switch that only Mario can activate. That switch reveals the stamp. The stamp is Small Mario. This page was last edited on March 10, 2019, at 01:59.